All Ben wants is a Mongolian fighting fish. He's saved his allowance for weeks and finally has enough to go to the pet store. But instead of his fish, he comes home with a talking cat from Eidolon, the Secret Country. Ben learns that this is just a small piece of the magical creature smuggling that is going on and that with each creature taken from their home, the magical land grows weaker. And so does Ben's mom, the long-lost queen of Eidolon. Ben exposed Mr. Dodd's vile pet emporium in The Secret Country, but that was not enough to put a stop to his evil scheme. 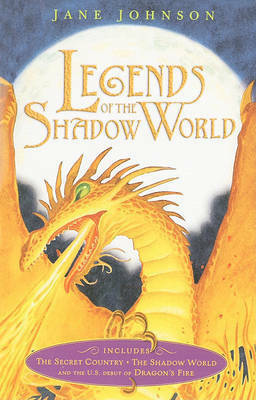 In The Shadow World, Queen Isadora goes back to her homeland to help the magical creatures overcome the dog-headed Dodman. Ellie, Ben's sister, follows and lands in a trap. The Arnold children are destined to save the Secret Country, but first they must save each other. The battle continues in The Dragon's Fire, but the magical creatures under Queen Isadora's guide are not fairing so well. Before Ben and the others ride to her rescue, she is captured by the Dodman and taken to the castle for a wedding ceremony. Her wedding ceremony. But first the Dodman must get rid of Ben's father. It is a fight to the finish when baby sister Alice goes through the most extraordinary transformation, vanquishes the Dodman, and reunites her family for good. Jane Johnson is the director of HarperCollins UK's fantasy and science fiction list and for many years was the publisher of J. R. R. Tolkien's work. While she has written adult novels as both Gabriel King and Jude Fischer, the Eidolon Chronicles is her first series for children. Ms. Johnson lives in London and Morocco. Visit Ms. Johnson at her website, www.janejohnson.eu. Adam Stower has a rich imagination and loves fantasy and adventure stories. He studied illustration at the Norwich School of Art and Design and at the University of Brighton, and lives with his daughter in Brighton, England.